I am very thankful to be able to fish as often as I do and be able to share in the joy by taking people fishing and writing about it. It is a gift that humbles me this holiday season and throughout the year. Allow me to share ten reasons why fishing brings me… and so many other anglers… joy. 1. When the sun rises and I am on the water it warms my soul no matter if it is hot or cold outside and this brings me great joy. 2. And, when the sun sets it brings me joy too as I know God’s work is done for the day and hope he will bring a good fish bite for the night. 3. It brings me joy when I cast my lure and a striped bass hits it with all the force of nature. 4. Fishing brings me joy when I am trolling and I hear the rapid click, click, click of my reel and know a fish is on. 5. When I see the water, when I step on a dock or on my vessel, my heart is filled with joy. 6. I see the schools of bait, the water boiling with bluefish, the seals and whales and they all bring me great joy. 7. I must admit, I am hooked on the adrenalin rush, my heart beats fast and I am filled with joy when I realize a fish is near and I may catch it. 8. When I fillet my catch I am filled with respect for nature and the fish I caught. I am thankful to God for the food he has brought my way and filled with joy that I am going home with fish in the cooler. 9. When I take pictures of people who have caught fish on my boat they are always smiling. This brings me great joy. My office walls are filled with these trophies. 10. I am an advocate for the sea, the Bay, boating and fishing all for a very selfish reason. I do not want anyone to steal my joy. Michael Tougias, noted lecturer and author of 19 books, will be the guest speaker at the November 28th Rhode Island Saltwater Anglers Association (RISAA) meeting. He is the author of such books as Fatal Forecast, The Finest Hours and now his latest book, Overboard! which tells of harrowing experiences at sea with the yachts Almeisan and At Ease. The meeting will be held at the West Valley Inn, West Warwick, RI at 7:00 p.m. Non-members are requested to make a $10 donation to the RISAA Marine Fisheries College Scholarship Fund. RISAA members attend free. Optional dinner available between 5:30 p.m. and 6:30 p.m. for an additional cost. Striped bass. Shore anglers have had it tough this year, but now striped bass fishing from shore has been very good. 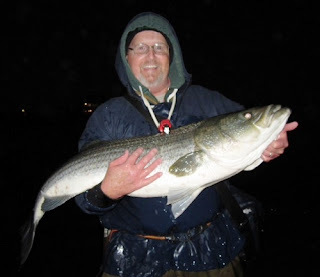 Steve McKenna from Cranston, RI, a noted shore angler and an associate at Quaker Lane Outfitters said, “Fishing for bass and blues remains excellent in the surf down around the south shore of Rhode Island. November has been the best month so far of just a so so season. I have over 100 bass this month. The best being a 44 pound fish caught on November 1 in the surf at Matunuck. The big bass hit one of my rigged 9 inch black Slug- gos. Fishing has been really great and nobody is fishing!! 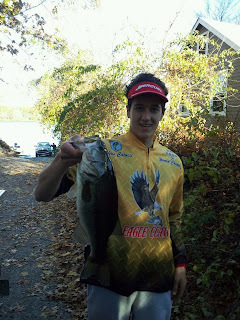 !” Steve caught, weighed and released the 44 pound bass in matter of minutes while in the water. Large bass tend to be egg bearing females, so it is always good to practice catch and release as Steve does. Menhaden purse seine skiffs of the FV TIDELAND in the Chesapeake Bay near Reedville, Virginia. 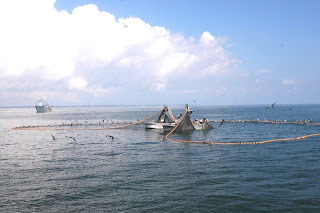 Vessels like these are owned by Omega Protein, a fish reduction company, that many say is a monopoly as they are responsible for harvesting 80% of all menhaden on the east coast. Last week the menhaden won. They won because the Atlantic States Marine Fisheries Commission (ASMFC) Menhaden Board voted to reduce the amount of menhaden that can be caught. The ASMFC regulates commercial and recreational fishing on a coast wide basis. This action is expected to put an end to overfishing and allow the species to reach sustainable levels. Menhaden are used by recreational anglers as bait for striped bass and are harvested commercially for use as bait in lobster pots, sold to bait shops, etc. 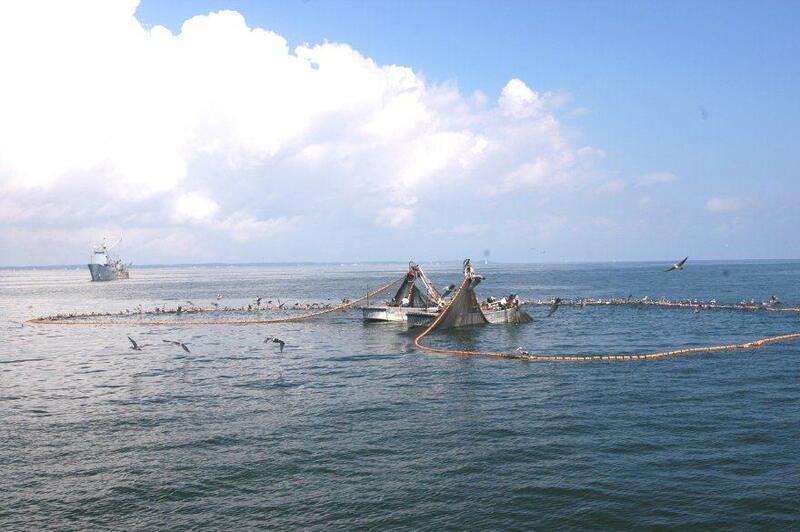 However, 80% of all Atlantic coast menhaden are harvested by one reduction industry company, Omega Protein of Reedville, Virginia. Last year Omega harvested 404 million pounds of menhaden for use in pet food, live stock feed, fertilizer and fish oil pills. Over that past month the ASMFC held several public comment hearings up and down the Atlantic coast on menhaden asking for comment on several menhaden regulation options including one for status quo (no change) to as much as a 45% reduction. The menhaden committee first voted on a new threshold. Steve Medeiros, president of the Rhode Island Saltwater Anglers Association (Rhode Island’s largest recreational fishing association with over 6,500 members) said, “(RISAA advocated) to change the threshold to 15% of Maximum Spawning Potential (MSP). This means if the mature population of menhaden falls below 15% it will be considered overfished.” Over 91,000 individuals and organizations commented in favor of a 15% threshold and only 35 said “Status Quo”. The next steps for the ASMFC Menhaden Board will be is to recommend ways to achieve the new goals. Regulations similar to the ones in force here in Rhode Island for State menhaden regulations are some of tools ASMFC fish managers will be considering. Regulations relating to boat size and gear, allowed, aerial stock assessments by plane and helicopter, etc. The vote was a great win for recreational anglers, conservationists and and most of all the menhaden. The Rhode Island Department of Environmental Management cut the ribbon on a new, 100 kW wind turbine at Fishermen’s Memorial State Park and Campground in Narragansett this past Monday. The 117-foot, Northwind 100 kW wind turbine will supply about half of the electrical needs for this popular state park and campground each year. The wind turbine and accompanying online “green energy dashboard,” will show the amount of clean energy being produced at Fishermen’s Memorial and will be available to campers and the general public beginning next spring. The Marine Fisheries Division of DEM held a public hearing on Wednesday, November 9 at the University of Rhode Bay Campus in Narragansett. DEM took public comment on a variety of items including commercial summer flounder, scup and black sea bass quota management options. Public comments were also taken on a cod fillet law. Public comment seemed to be in support of the third option presented which was to allow filleting of cod at sea with the retention of cod carcasses so law enforcement can make sure recreational anglers are adhering to minimum size requirements. All species management options will go before the Rhode Island Marine Fisheries Council for consideration. Tautog fishing was fair this week as anglers had difficulty getting out and fishing with high winds and seas. The Seven B’s, a party boat out of Galilee, RI reported good fishing early in the week with several customers limiting out with a nine pound tautog taken Monday. Ken Ferrara of Ray’s Bait & Tackle, Warwick, said, “Customers are fishing at the Coddington Cove, Middletown jetty outside and inside the jetty when Coast Guard vessels are not docked there.” Sunday there were fifteen boats fishing the jetty early in the day with most boats leaving as winds picked up to 25 to 30 miles per hour. A quick current and high winds make fishing difficult. Francis Fleet party boat captains out of Pt. Judith, Narragansett reported a fair day of tautog fishing this past Sunday with the largest fish weighing in at seven pounds. Cod fishing is picking up as the water cools and black sea bass fishing is good. Francis Fleet cod anglers landed all their cod in the first hour of the day Sunday and then the bite was off. The largest cod was fifteen pounds, however, anglers caught at least six black sea bass each. Striped bass are migrating and on the move, so either you’re on them or not. Shore angler Dave Pickering and his sons landed up to two-hundred school bass this week along southern coastal beaches using Cocahoe Minnow and a variety of swim baits. Isolated reports of anglers landing bass in the Narragansett Bay and the bass site on Block Island has softened said Captain Rick Bellavance. 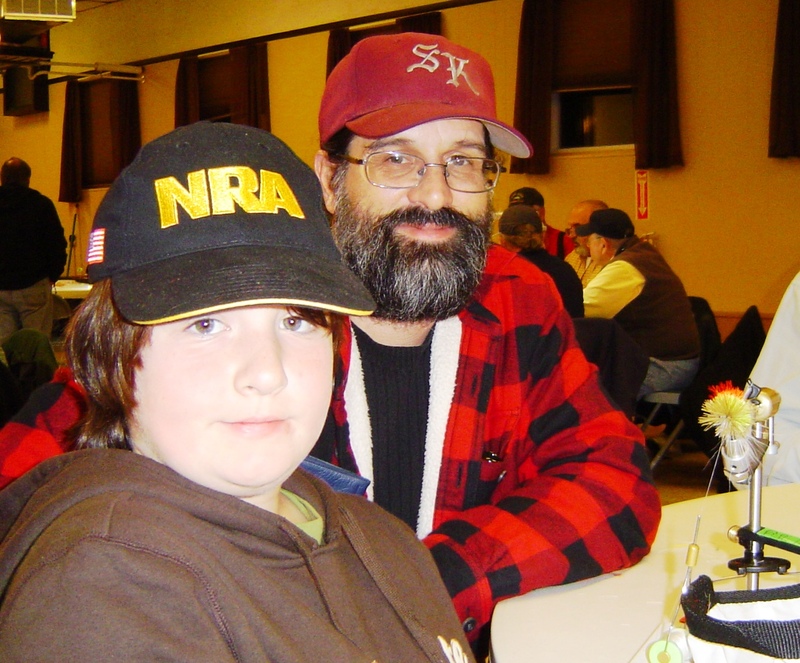 George and Michael Fotiades of Narragansett, RI enjoy tying flies at a United Fly Tyers of RI monthly meeting last week. George, eleven years old, has been fly tying for three years. Four year old Liam Palumbo of North Kingstown, RI with the first tautog he ever caught this weekend off the north end of Hope Island on No Fluke Charters. Richard Palumbo (seven years old) of North Kingstown, RI caught his first tautog this weekend (and the fifth fish of is lifetime as he was proud to claim) this past Sunday. Chris Catucci of Warwick, RI with the bass he caught last week at Warwick Pond. “Just fluff it up, like this, to give it that 3-D effect.” said Mike Maddalena as he instructed saltwater fly fisherman on how to make a Peanut Bunker (juvenile menhaden) fly. The Peanut Bunker fly ended up being about four inches in length. All five anglers at his table including, Jim Mancini of East Greenwich, RI, watched intently as Mike fluffed up his fly strategically being held in place by his fly vice as he instructed the group. Maggie Grenier of Jamestown, RI has been fly fishing for over ten years with her husband and tying flies for about five years. “We fly fish together, but I do most of the tying. We usually fish freshwater even though we are surrounded by saltwater in Jamestown.” Maggie and the group at her table were tying what you might call a juvenile May Fly… a blue winged olive emerger. I experienced these and other fly fishing and fly tying stories from men, women and children at last week’s United Fly Tyers of Rhode Island’s (UFTRI) monthly fly tying workshop held at the Knights of Columbus Hall, 475 Post Road, Warwick, RI. They meet there the first Wednesday of each month from September to May at 6:30 p.m. The public is invited to attend and try fly tying at no cost the first time, then if you like it, become a member for $30 a year and receive expert instruction and fly tying materials for the entire year. Each month 40 to 60 members in groups of five or six meet to tie flies. The UFTRI has an online catalog of flies on their web site at www.uftri.org . Members who see a fly in the catalog that they would like to learn how to tie can request it as one of the five or six featured flies they focus on each month. The UFTRI meeting I attended last week was great. Club members and volunteers are very welcoming to newcomers and beginners and it was obvious that members enjoy each other’s company, that they meet to tell stories, learn from each other and often end up fishing together. Peter Burgess, UFTRI vice president, said, “The first thing we tell people when they come in the door is just try it tonight, don’t give us your $30 membership fee until you think you might like to join.” No need to be concerned if you do not have the tools. Peter, UFTRI president Mike Maddalena or one of their fellow club volunteers will greet you at the door and set you up with a fly tying kit for the night that includes a vice. For information visit their website at www.uftri.org . NOAA has determined that a petition to list alewife and blueback herring, collectively referred to as river herring, under the Endangered Species Act presents enough scientific and commercial information to merit further review. As a result, the agency will conduct a formal review of river herring population status and trends. If NOAA determines that a listing is appropriate, the agency will publish a proposed rule and take public comment before publishing a final decision. However, if NOAA determines that that listing these species is not appropriate, the process ends. Both alewife and blueback herring are found in coastal waters and rivers from Canada to North Carolina, although blueback herring’s range extends farther south to Florida. Both species are managed by the Atlantic States Marine Fisheries Commission. Rhody Fly Rodders, the oldest saltwater fly fishing club in America, will hold their next meeting on Tuesday, November 15th. Doors open at 6:30 p.m. for a short session of fly tying, with Steve Messier tying Atlantic salmon flies and Armand Courchaine tying his favorite Striped Bass Fly. At 7:30 p.m., a slide presentation on Tarpon fishing, and the story of artist, Armand Lamontagne's carving of Ted Williams will be presented by Gene Matteson. The meeting, which is open to the public, will be held at the Riverside Sportsman Association, Mohawk Drive (off Wampanoag Trail, ¼ mile north of the WPRO radio station) in East Providence. Striped bass. RISAA angler Joe Petuli said, “Caught about eight fish mid morning (Saturday) around Conimicut Light, all on the troll fishing amongst the birds. 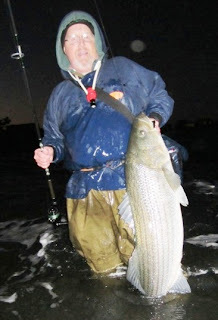 (Striped) Bass were deeper (used down rigger)and a couple were in the 32-34" range. Two heavy bluefish came on top… blues were spitting juvie menhaden. All fish released.” Striped bass bite has slowed around Block Island but some great fish still being caught. 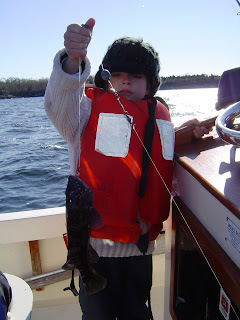 Tautog fishing is fair to good when anglers can get out due to rough seas last week. Captain Rich Hittinger said he fished the Seal Ledge area off Newport early last week catching keepers with shorts mixed in with rough water. This weekend I had the pleasure of tautog fishing with Liam (four years old), his brother Richard (six years old) and their dad Richard Palumbo from North Kingstown. 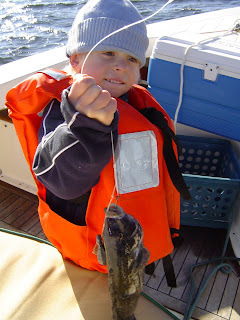 The boys caught their fist tautog ever off the north side of Hope Island. Tom Pelletier an associate at Quaker Lane Outfitters, North Kingstown, said, “Customers are catching fish off Newport and southern coastal shores.” Dave Howe on the RISAA blog reports, “All keepers on Brenton Point today (Sunday) in 30 to 35 feet.” The Seven B’s party boat out of Galilee, RI reported a good black fishing day Saturday with a few limits on the boat with the largest fish over seven pounds. Rich Golembeski with two of the tautog (the largest was 8.5 pounds) that he caught near Whale Rock in Narragansett last week. So who gets the menhaden... the recreational angler, the commercial bait fisherman, the large commercial reduction processor or… the ecosystem and striped bass that eat it as a primary food source? Being a fish manager is difficult. It is difficult because you have a lot of interests vying for the same resource and when the resource is scare (or on the decline) the challenges get all the more difficult. That is what is happening to Atlantic Menhaden and the Atlantic States Marine Fisheries Commission (ASMFC) this month. After a month of public hearings up and down the east coast, the ASMFC closed its comment period November 2, 2011 on Atlantic Menhaden Draft Addendum V which entertains regulation revisions on menhaden. The species, according to 2008 data, and 2010 fish landings is being over fished, new survey data will be available in 2012. Fishing thresholds and harvest levels are being considered as well as a range of tools to manage the species for all those vying for menhaden. Proposed regulation options have created quite a stir in fishing circles. Recreational anglers have mobilized and attended the ASMFC November 2 meeting in mass. They claim menhaden play a large role in the ecosystem… as a primary food source for bluefish, weakfish and striped bass but also as filter feeders helping to reduce nitrate levels in our bays and estuaries. Recreational anglers including the Rhode Island Saltwater Anglers Association (RISAA) and the national Recreational Fishing Alliance (RFA) and the environmental community (such as the PEW Environment Group) claim that the decline of menhaden on the east coast (now at 10% of what it used to be) can be attributed primarily to the reduction processing industry. Specifically they have singled out Omega Protein Corporation of Reedville, VA and Houston, TX as the primary culprit. They claim that the reduction industry (with Omega Protein Corporation holding a monopoly) took 27% more fish in 2010 than they did in 2009 and overall the fishery has been fished over quota for the past fifty years. In fact, PEW planned to run an ad in the Providence Journal this week encouraging Governor Lincoln Chaffee and the Rhode Island ASMFC delegation to support and vote for tougher menhaden catch regulations. The reduction industry (and Omega Protein Corporation) have large capacity “primary” holding ships, a fleet of airplanes that find fish for their fishing vessels, and smaller purse seine net vessels. Purse seine nets allow them to take large numbers of fish (entire schools in a matter of minutes). 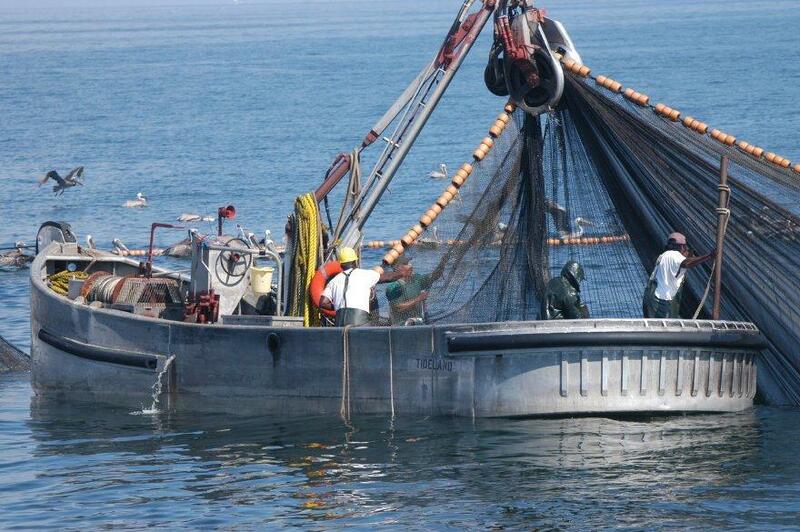 The purse seine net has been around for over a 150 years. The net is set by surrounding a school of fish, enclosing the lower end of the net (pursing) and then unloading the fish onto a boat. Advocates ask that vessel and gear restrictions be explored as well as reduced thresholds and quotas for the reduction industry. They are concerned that once menhaden start to bounce back, quotas will be increased and the downward cycle will begin again. The historic low numbers of fish and menhaden’s importance to the ecosystem are being cited as reason to develop regulations that restrict the reduction industry and other menhaden user groups as well. The importance of menhaden to the ecosystem was brought to light in the Chesapeake Bay recently as malnourished striped bass (that did not get enough menhaden because they were overfished in the Chesapeake) developed a disease, mycobacteriosis, which led to a decline in healthy fish up and down the east coast (visit http://www.noflukefishing.blogspot.com/ and search “mycobacteriosis” for more information). The recreational angler uses menhaden for bait (to catch striped bass, either live or cut up in chunks). The commercial bait fishers sell their catch to lobstermen who use it as bait for their traps, they also sell their catch to bait shops, and the commercial reduction industry (primarily Omega Protein Corporation here on the east coast with its monopoly) process menhaden for use as fertilizers, pet food, animal and human dietary supplements and for human consumption of omega-3 fish oil. These are all good uses. However, it is hoped that fish managers and the ASMFC will consider the ecosystem first as the primary concern… protecting it so that the striped bass, weakfish, bluefish and other species that need menhaden to survive and thrive get their share of menhaden first. History has proven if we do not have enough menhaden for the ecosystem… the system will fail. At this week’s Rhode Island Marine Fisheries Council meeting the RI Department of Environmental Management (DEM) Division of Fish and Wildlife presented the first saltwater recreational fishing license program annual report. DEM is required to report annually on the program, revenues raised and how it will spend monies to promote the saltwater fishery in Rhode Island. About $250,000 net is expected to be in the license fund account from 2010 and 2011 license fees (it was decided to have funds accumulate in 2010). Most of the money is being spent to match federal fund grants. Suggestions in the annual report that were reviewed at the RIMFC Tuesday night meeting included funds for better data collection, boat ramp improvements and maintenance, funds for recreational fisheries management support staff, the artificial reef program, fish stock assessment support and funds for education, information and public outreach. NOAA recently released the 2010 Final Report on the Performance of the Northeast Multispecies (Groundfish) Fishery. Findings from the report will be presented at the New England Fishery Management Council’s “lessons learned” workshop this week in Portland, Maine. 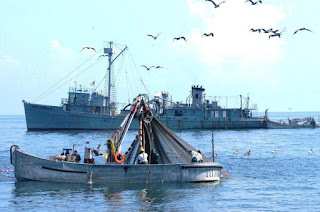 In a press advisory this week NOAA said the workshop is expected to yield important new recommendations for the groundfish fishery that NOAA and the Council can work to put in place. These actions, coupled with other actions underway at NOAA and through the Council, will help fishermen and fishing communities operate successfully despite low quotas required by Congress to end overfishing and rebuild stocks. Sector management is part of that effort, as well as actions taken in the 2011 fishing year to improve the industry’s access to fish. Over the last year, NOAA moved quickly to increase catch levels based on new science on fish stocks and allowed fishermen to fish in some previously closed areas, in particular areas close to the shore where smaller vessels fish. NOAA and the Council are considering additional actions, such as allowing fishing in previously closed areas and rolling over unused quota to the following fishing year. Earlier this month NOAA agreed to fund at-sea monitoring through the end of the 2012 fishing year which ends on April 13, 2013. The report shows that groundfish revenues decreased in 2010 compared to 2009. But overall, revenues to groundfish vessels, including revenues from non-groundfish species, increased. Despite lower catch limits required to end overfishing and rebuild stocks, the groundfish industry obtained more value from fewer fish landed and less fishing effort expended. Striped bass bite continues off Block Island with reports of fish in the 40 pound range being taken with ells. Ken Ferrara of Ray’s Bait & Tackle, Warwick, reports a good bite in Apponaug Cove as anglers fish under schools of menhaden for both striped bass and bluefish. Dave Henault of Ocean State Tackle, Providence, said, “The Providence River has been producing bass up to 45 inches… pogie and mackerel chunks are the preferred baits… Cape Cod Canal anglers report good fishing with a mix of bass and blues.” Ron Nalbandian reports on Monday, “No more that 30 yards offshore on Weekapaug Beach…(I caught) a bunch of school bass, the largest was 26 inches.” Ron was using 4” white shad as bait. Tautog fishing remained good this week and last week. Gisele and Rich Golembeski caught several nice tautog while fishing rock piles near Whale Rock off Narragansett. Rich caught a great 8.5 pound fish and five in the 17” to 20” range. They used green crabs, cut in half in approximately 30 feet of water. Dave Henault of Ocean State Tackle said, “Tautog fishing has been good in the Providence River at India Point Park, Conley Dock and structure throughout the river. Tautog fishing at the breakwater in Wickford has been productive as well.” Francis Fleet captains reported a good tautog bite Monday with most anglers catching their limit.